Bollywood celebs Katrina Kaif, Aishwarya Rai Bachchan, Alia Bhatt, Elli Avram, Neha Dhupia, Saiyami Kher, Gauahar Khan, Prachi Desai, Bipasha Basu, Amitabh Bachchan, Sooraj Pancholi, Siddharth Malhotra and many others graced the red carpet of Filmfare Glamour and Style Awards 2016, which was held in Mumbai on October 15. B-town beauties were seen high in fashion with their amazing and impressive style statements. The fashion awards event saw Bollywood stars making a range of sartorial statements in designer outfits. Let’s check out Who Wore What on the night of glamour. 1. Aishwarya Rai Bachchan: The Ae Dil Hai Mushkil actress turned up the heat as she walked the red carpet in a beaded mesh gown by a Kuwait-based label, La Bourjoisie. We totally loved her hair and makeup. We also captured a candid moment of Amitabh Bachchan with his DIL Aishwarya Rai Bachchan. 2. Alia Bhatt: Alia Bhatt rocked the red carpet in Ulyana Sergeenko outfit. The bubbly actress finished out her look with Smokey eye makeup and strappy burgundy sandals. 3. Katrina Kaif: Katrina Kaif did not look less than a barbie doll in a pink strapless Oscar De La Renta gown with a hot pink lip. 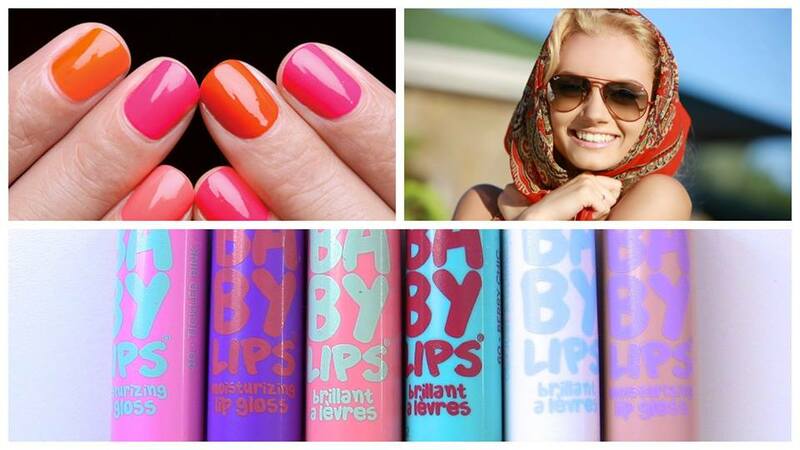 After a break-up with Ranbir Kapoor, she is making a glamours come back. 4. Disha Patani: M.S Dhoni-The Untold Story actress Disha Patani looked stunning in a glittering maroon slit cut gown paired with heels. 5. Elli Avram: While others chose to wear a gown, actress Elli Avram picked a satin blue saree and she looked killer yet bold! 6. Prachi Desai: Prachi Desai looked breathtakingly beautiful in pretty red Nicolas Jebran dress with a floral ring from Anmol Jewellers and glittery pumps. 7. Gauahar Khan: Former Bigg Boss winner Gauahar Khan looked a true vision in white classy gown. She finished out her elegant look with a sleek hairdo and bold red lip. 8. Bipasha Basu and Karan Singh Grover: The two are giving us major couple goals. Both Karan Singh Grover and his beautiful wife Bipasha Basu picked Shantanu and Nikhil outfit for the Filmfare Glamour and Style Awards 2016. The Bong actress looked stunning in a bustier gown while Karan looked dapper in a bandh gala suit. 9. 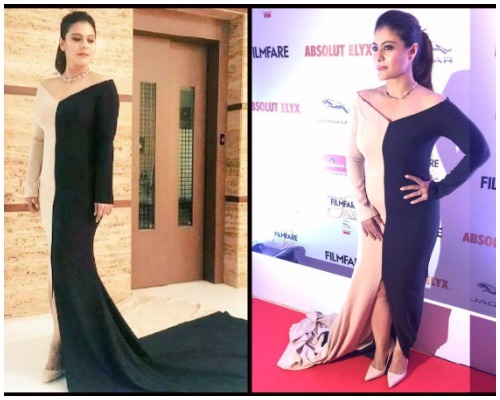 Kajol: Kajol looked stunning yet glamorous in a color block gown by designer Nikhil Thampi but her makeup and accessories flattered her looked totally. 10. Neha Dhupia: Neha Dhupia never fails to impress with her fashion sense and this time too, she rocked it in a red Shantanu and Nikhil gown with smokey eyes, gold jewelry from Anmol and a Bottega Veneta clutch. 11. Amy Jackson: Freaky Ali actress Amy looked hot and bold in thigh high slit cut black gown by Gemeli Power. She finished out her look with choker and black sandals. 12. 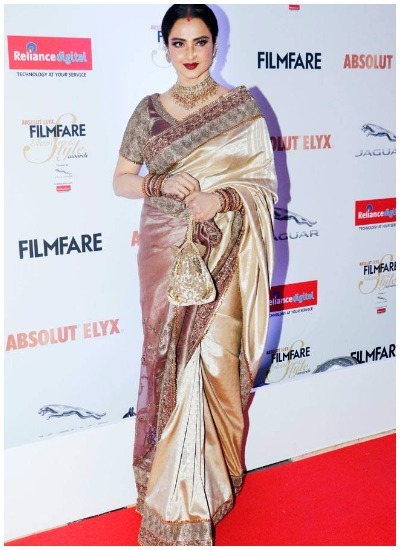 Rekha: The evergreen diva, Rekha walked the red carpet in elegant golden benarasi Sari and a matching potli bag. 13. 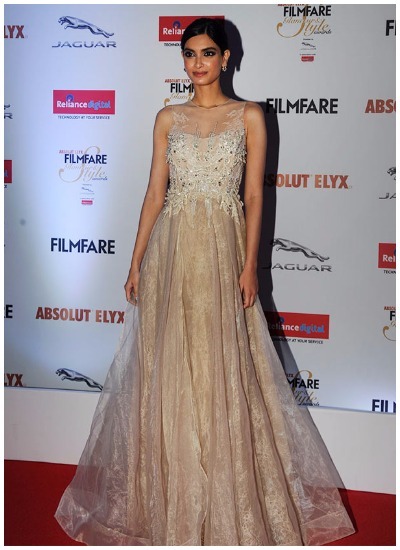 Diana Penty: Wearing a Falguni and Shane Peacock, Diana made a stunning and pretty appearance at the fashion night. 14. Surveen Chawla: Wearing an olive Kiran Gupta gown, Surveen looked killer and we are totally drooling over her stunning gown. Next : You Won’t Believe Ajay Devgn’s Daughter Nysa Was Angry With Him For A Year and A Half!